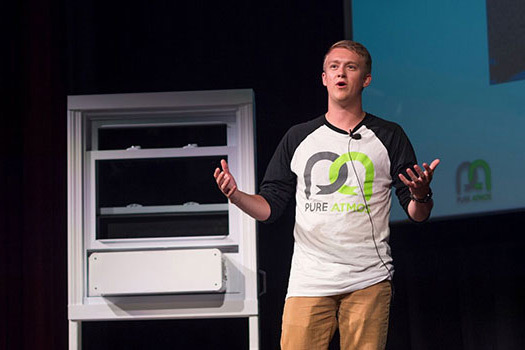 Nathan DeMario found his passion in developing new, more energy efficient technology for air conditioners at Phase Innovations. Nathan DeMario, a mechanical engineering graduate student, is the chief technical officer of Phase Innovations. From South Wales, N.Y., DeMario joined the Phase Innovations team during his undergraduate education at Alfred State College. The company’s goal is to develop the next generation of cooling and dehumidifying units, with an aim of helping reduce energy consumption of cooling units as well as reduce harmful pollutants given off by traditional refrigerant chemicals like hydrofluorocarbons. For those interested in learning more about Phase Innovations or getting involved with the project, go to https://www.phaseinnovations.com/ or email ncd4192@rit.edu. Question: What is Phase Innovations? Answer: Phase Innovations is working toward developing new air conditioning technology. Currently, the mainstream air conditioners that consumers will buy haven’t been changed for 35-plus years. What we are doing is developing a technology called a membrane heat pump to replace traditional air conditioners for certain applications. Specifically commercial at first, but we would like to expand to residential spaces as well. We’ve also started working on in-home ventilation systems. Question: How did you come up with this idea? Answer: I was introduced to this technology while I was at Alfred State. When I was a junior I had a professor, Dr. Jon Owejan, and he developed an early-stage concept of the technology and was looking for a fluid mechanics team to create a prototype to demonstrate how this technology worked. I was interested, so a couple of my buddies and I decided to create a team and go for it. The fall after we created this prototype, Jon approached me and said that he was thinking about going for a grant to continue the project and asked me to be a part of the grant team. He said it might be a long shot to get it but we might as well go for it, and I ended up joining him. In December, we found out that we got the grant and we moved forward with the development of the technology and the product. Question: What resources on the RIT campus have you utilized to help build this technology and your company? Answer: There are a lot that I’ve used, but there are three main ones that helped our business grow. The first is the Saunders Summer Startup program offered through Saunders College of Business and the Simone Center for Innovation and Entrepreneurship. Through that 14-week program, we were able to determine an ideal price point for one of our products, what kind of market we would be in and who our biggest competitor would be. We were also able to build a prototype and pitch it to investors. I truly had an amazing experience with that program. The second resource I found instrumental is the Construct. It’s extremely important for innovators to be able to have the necessary tools to build whatever they are working on. I would not have been able to make my prototype without that resource. The third resource is Venture Creations, which has provided us with our first commercial space for our business as well as access to mentorships, marketing information and support, and many other resources that you might not even be aware of. Question: How will this technology enhance cooling and dehumidifying technologies? Answer: Currently, the absorption chiller uses heat to create cooling power, which has a lot of value when people use it. Let’s say I am an injection molding plant. I have machines that are all very warm and I have to run cooling pumps to keep things manageable. If I have a technology that can take the heat from those cooling pumps and apply it to another load, like my air conditioning load, the energy bill that I pay in the end is much less. I’m already paying for energy to get one machine hot, so if I can repurpose that extra energy and use it for something else, I can get more accomplished with my dollar. The issue with this particular technology is that it doesn’t scale to handle cooling loads that smaller manufacturing plants or commercial facilities might use. Our technology is the solution for companies that want to utilize the absorption chiller technology, but aren’t large enough for it to be economically viable. Our technology also uses water rather than hydrofluorocarbons, which are used in traditional air conditioners and contribute to greenhouse gases that harm the environment. Because we are completely water based, we don’t need to worry about putting harmful exhaust into the air. Question: What was your reaction when you were told you were nominated for the award? Answer: I didn’t believe it at first; I thought it was a scam. Who would nominate me for this? It just seemed so unreal. Then I got curious, did a Google search and fished around to see who nominated me. Once I realized that it was real I was very humbled by it, especially when I read about the award and the people who have been honored with it before. Question: Looking forward, how do you think Phase Innovations will grow? Answer: It’s hard to tell in the start-up world, but for us our long-term goal is to explore this unestablished market of scalable technology. There are a lot of ways to do different things involving heat transfer, fluid mechanics, gas separation and desalination, and it seems as though we can look into how to make these structures completely scalable. The same technology that enables our air conditioner to function could be used for the desalination or gas separation process with simple changes to the design. There is such an array of areas that we can fit into, and that’s where we see ourselves potentially going.